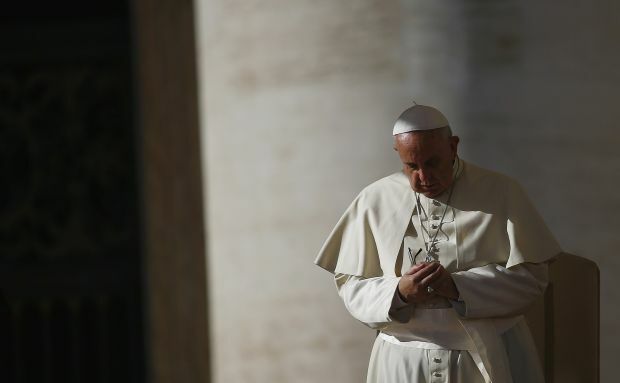 VATICAN CITY (CNS) — Pope Francis condemned the “unacceptable episodes of violence” in Jerusalem, episodes that “do not spare even places of worship,” after an attack in a synagogue left four worshippers, a policeman and the two attackers dead. “Violence leads to more violence,” Patriarch Twal told Catholic News Service. He said he sent condolences to the families of all the victims of the recent wave of violence that has rocked Jerusalem as Israel moves toward expanding Jewish settlements in the area and Palestinians fear a Jewish presence on the shared holy site of the Temple Mount/Haram al-Sharif, in Jerusalem’s Old City. A day prior to the synagogue attack, a Palestinian bus driver who worked for an Israeli cooperative was found hanged in his bus at the terminal. Israeli police called the death a suicide after a medical investigation, but the man’s family and the Palestinian media maintain that it was a lynching. Some have said the synagogue killings were in retaliation for his death. “We hope that by Christmastime there will be no more revenge and no more killings,” he said. He asked for prayers for the peace of Jerusalem, the Holy Land and all its inhabitants, so Jerusalem could return to its vocation as the city of peace.